The book I chose to read for our class is How We Know What Isn’t So: The Fallibility of Human Reason in Everyday Life by Thomas Gilovich. This book was filled with interesting examples of how well educated people can believe things that have no scientific evidence to back them up. 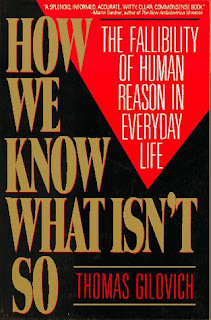 It explains how we can simply put aside evidence we don’t agree with and concentrate specifically on what does goes along with what we believe in. While reading this book I noticed a lot of the information was familiar because they took out some experiments for our textbook. Topics ranging from ESP to athletes not wanting to be on the cover of “Sports Illustrated” because they are terrified of being jinxed with an unsuccessful season are examined. It was extremely interesting to read about all of the theories and experiments that prove we sometimes only see what we want to see and distort the truth in numerous ways. My favorite part of the book was on ineffective “alternative” health practices. Many individuals with untreatable diseases become so threatened that they are desperate enough to fall for the health practices. Gilovich says that Americans spend ten billion dollars per year on bogus remedies. I never knew that AIDS patients would try worthless rituals such as injecting themselves with hydrogen peroxide to try to cure the disease. He explains that it’s not only well educated people who are vulnerable to these beliefs. Gilovich mentions, “Francis Bacon believed that warts could be cured by rubbing them with pork grinds” and “George Washington thought that various bodily ills could be cured by passing two three-inch metal rods over the afflicted area”. I found this section interesting because its unbelievable to see how individuals can have faith in these practices and swear by them. This section is related to the Bogus Therapies we covered in class. These therapies go against well-established principles and common sense. However, individuals are still willing to try them. Here is a video explaining some of these quackery treatments. One section on cognitive determinants of questionable beliefs reminded me of our course. Gilovich states that “our expectations can often be confirmed by any set of ‘multiple endpoints’ after the fact, some of which we wouldn’t be willing to accept as criteria for success beforehand”. He mentions the belief that things happen in threes. People believe that events such as plane crashes, birth announcements, and serial-killing sprees tend to happen in triplets. The example he gives is that if three planes crash in a month, then the period of time that counts as their happening together is one month. If the third plane crash doesn’t happen for another month, the period of time is stretched to two months. He explains that if we allow the window of opportunity to be extremely flexible, such beliefs can only be confirmed. This can be related to the topic of Everyday Judgment Gone Wrong. We are searching for information that will confirm our beliefs. I really enjoyed reading this book. It made me understand why I come to the conclusions I do in everyday life and whether or not those conclusions are valid. It allowed me to think more critically about things. The information is very valuable and it will definitely stick with me. Here's a silly video of my puppy who has ESP. I did my book report on this book also and I can't believe the statistic that read that in the U.S.A. alone ten billion dollars are spent each year on quackery! And that was in 1991, with the rise of the internet, it is likely that that number has doubled since then.